Tired of American superheroes? Check out "Guardians" for superhero action with a Russian twist! Tired of American superhero movies and their countless sequels? 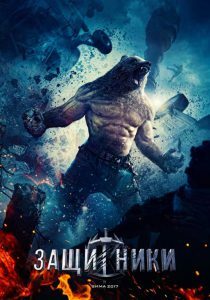 Have no fear, Russia is coming to save the day with Guardians (Защитники) — an action-packed offering reminiscent of Marvel’s Avengers franchise. There’s a massive super-bear in Guardians‘ team of Russian superheroes. During the Cold War, a secret organization called “Patriot” recruited individuals from across the Soviet Union’s diverse nationalities and created a team of superheroes through DNA modifications. After the USSR’s collapse, the team members hid their identities — but are recalled back to service when a mysterious evil force attacks Moscow. Besides Moscow, Guardians was apparently also filmed in the now Russian-controlled Crimean peninsula. It will be interesting to see what aspects of contemporary Russia’s geopolitical ambitions have influenced the film, as American superhero movies oftentimes end up reflecting the US’s “world police” reputation. The pan-Soviet composition of the superhero team is particularly noteable given President Putin thinks that the USSR’s breakup was the “greatest geopolitical tragedy of the 20th century” and is trying to bring former Soviet states closer together with initiatives like the Eurasian Economic Union. What’s even more intriguing is that, apparently, a sequel for the movie, which will include Chinese characters and locations, is already in the works. As a Trump-led America retreats from the world stage, will China and Russia take a more prominent role both on the political and cinematic arenas? Only more superhero movies can tell. Guardians premieres February 23, 2017 in Russia. A US release date has not been announced.